Both nature and the weather are telling us that autumn is arriving in the Northwest. 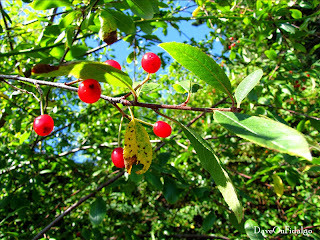 Now fruiting, this is Bitter Cherry which is a local native indigenous to my property. It is a small tree valuable in the wildlife garden. The tiny fruits are enjoyed by songbirds and mammals. Through the winter, Grosbeaks will crack open the pits to extract the seeds. Butterflies are attracted to the flowers and deer will browse on the twigs. It is also known as Bird Cherry because of its attractiveness to avian species. Be aware that the bark and seeds produce cyanide which is poisonous to humans. The fruits may be eaten, but are very bitter, as the name implies. Mine is growing at the edge of the bank to the beach, evidence that it tolerates seaside conditions. If you are planning a garden to attract wildlife, consider the plants and trees that grow naturally in your area.